Chair for a master ST-4, buy at the price of 92 in Europe. Beauty chair for a master has a backrest firmly attached to the seat, which enables secure for a person in the right position and you can easily move the chair to the right place. In addition, a useful feature for such work is the presence of a hydraulic pump, which adjusts a height up to 58 cm. 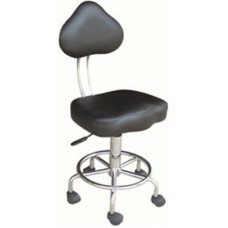 This provides additional comfort, as each person has certain features of the body structure and physique. For example, when high growth of the client and the absence of regulation of cosmetic chair, work is significantly complicated, because the master will have to be in an uncomfortable position. This can lead to swelling and pain in the neck, back and arms, which certainly affects the quality of work.